A Dhammapada for Contemplation is a version of the Buddhist classic, the Dhammapada; it is not a line-by-line translation but a free rendering that aims to communicate the living spirit of the text, unencumbered by rigid adherence to formal exactness. The intention of the author, Ajahn Munindo, was to present a contemporary version of the text for readers to use in their investigation of the Way. 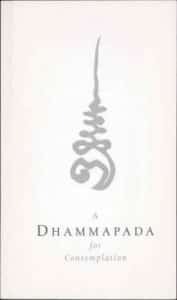 A Dhammapada for Contemplation presents a contemporary version of the Dhammapada for readers to use in their investigation of the Way.